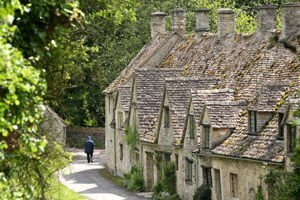 Cotswolds, with its limestone hills, is defined as one of the most picturesque areas in England, dotted with charming villages with typical rural architecture, and a pleasant atmosphere that comes from the many tea shops and pubs. This natural area is located in the southwestern part of the country. Dating back to 1966, Cotswolds entered the list of areas boasting outstanding natural beauty. In the year 2000, the British government decided to change its status to that of a National Park. A Beautiful area, surrounded by picturesque rolling hills, it has an area of 40 square kilometers and a length up to 145 km. The etymology of the name Cotswolds, is associated with the many grazing sheep in the area and the word "hill"
In Cotswold, you can see the perfectly preserved castles of Berkeley and Sadli, in addition to these lands, are found remains of prehistoric and archaeological sites of Roman times. Chipping Campden is a city with an interesting history and cultural heritage, which, besides the typical small stone houses with thatched roofs, can be seen the trading house with its sharp roof. You will also find a unique church - "St. James'”, which is the largest and most impressive in all of Cotswolds . Cirencester city, which is the second major center after London, has a population dating back to Roman times. This is the main town in South Cotswolds, which today is a modern, contemporary and busy center. A very interesting site to visit is the church that towers over the city, which has existed for the past 6 centuries. One of the most picturesque villages in the region is Bourton-on-the-Water, which impresses with its beautiful low stone bridges built over the little river Windrush. A short distance to the north of this village is the highest located village in the area - Stow-on-the-Wold, which has a remarkable central square, surrounded by buildings in pastel colors. Due to it’s small city streets, one would have to wait for the sheep to pass in-order to reach the market. Do not miss out on a visit to one of the perfectly preserved houses of local vassals, called Chataltan House.